More than any other major U.S. city, Atlanta regularly reinvents itself. From the Civil War’s devastation to the 1996 Olympic boom to the current housing crisis, the city’s history is a cycle of rise and fall, ruin and resurgence. In Planning Atlanta, two dozen planning practitioners and thought leaders bring the story to life. Together they trace the development of projects like Freedom Parkway and the Jimmy Carter Presidential Library. They examine the impacts of race relations on planning and policy. They explore Atlanta’s role as a 19th-century rail hub—and as the home of the world’s busiest airport. They probe the city’s economic and environmental growing pains. And they look toward new plans that will shape Atlanta’s next incarnation. 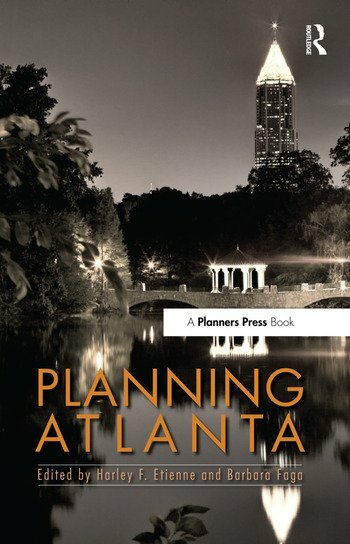 Read Planning Atlanta and discover a city where change is always in the wind. Harley F. Etienne is an assistant professor of urban and regional planning at the University of Michigan’s Taubman College of Architecture and Urban Planning in Ann Arbor, Michigan. Barbara Faga is a PhD candidate at Georgia Tech and was a 2011 Fellow at AECOM.